Amid the Oromo people’s peaceful struggle for self-determination and for a federal and democratic Ethiopia, the declaration of their traditional, socio-political governance system (‘Gada’) as UNESCO Intangible Cultural Heritage could attract much-needed international attention and help raise awareness of the Oromo’s plight. The Gada system comprises regulatory measures pertaining to issues such as conflict resolution, questions of religion and to women’s rights. In contrast to the modus operandi employed by the current, authoritarian government, the Gada form of governance contains provisions guaranteeing an effective system of ‘checks and balances’, the separation of powers and an institutionalised opposition – all of which provides safeguards against totalitarianism and a governmental abuse of power. Ethiopia hosted the 11th session of UNESCO’s Intergovernmental Committee for the Safeguarding of Intangible Cultural Heritage last week [28 November – 04 December 2016]. Chaired by Yonas Desta Tsegaye, Director General of Ethiopia’s Authority for Research and Conservation of Cultural Heritage, the Committee brought together representatives of 24 State Parties to the Convention. The Committee examined five nominations for inscription on the List of Intangible Cultural Heritage in Need of Urgent Safeguarding and 37 requests for inscription on the Representative List of the Intangible Cultural Heritage of Humanity. The Committee furthermore reviewed seven programmes proposed for inclusion on the Register of Best Safeguarding Practices. It then inscribed four of the nominated Intangible Cultural Heritages in Need of Urgent Safeguarding and 33 of the inscriptions on the Representative List of the Intangible Cultural Heritage of Humanity. The four inscribed cultural heritages in need of urgent safeguarding are: Bisalhães black pottery manufacturing process of Portugal, Chapei Dang Veng of Cambodia, Cossack’s songs of Dnipropetrovsk Region of Ukraine and Ma’di bowl lyre music and dance of Uganda. It also inscribed five programmes out of the seven proposed for inclusion on the register of best safeguarding practices. These are: Community project of safeguarding the living culture of Rovinj/Rovigno: the Batana Ecomuseum of Croatia, Festival of folklore in Koprivshtitsa: a system of practices for heritage presentation and transmission of Bulgaria, Oselvar boat - reframing a traditional learning process of building and use to a modern context of Norway, Regional Centres for Craftsmanship: a strategy for safeguarding the cultural heritage of traditional handicraft of Austria, and Safeguarding of the folk music heritage by the Kodály concept of Hungary. 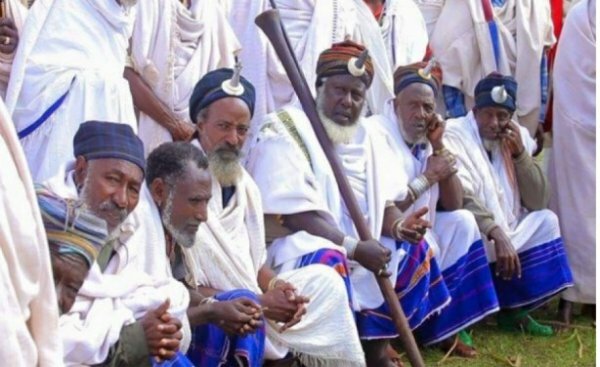 The big news for Ethiopia is that the Gada system, an indigenous democratic socio-political system of the Oromo, has been inscribed on the representative list of the intangible cultural heritage of humanity. Ethiopia also inscribed the commemoration feast of the finding of the True Holy Cross of Christ in 2013 and the Fichee-Chambalaalla, New Year festival off the Sidama people in 2015. Various sources indicated that the Gada system has the principles of checks and balances (through periodic succession of every eight years), and division of power (among executive, legislative, and judicial branches), balanced opposition (among five parties), and power sharing between higher and lower administrative organs to prevent power from falling into the hands of despots. Other principles of the system include balanced representation of all clans, lineages, regions and confederacies, accountability of leaders, the settlement of disputes through reconciliation, and the respect for basic rights and liberties. Sources indicate that the Gada system possesses some prominent unique features when compared to western democracies. Reserches identified the distribution of power across age groups as one of these distinctive features. In explaining this identifying characteristic, the researches remarked that western democracies are very deficient in the distribution of power across generations and age groups. They went on to argue that those who assume the position control most of the authority and wealth of the country. Further the young, poor and the elders are politically and economically marginalized in western democracies. With three Ethiopian cultural heritages inscribed in the past four years, Ethiopia’s efforts to have its cultural heritages recognized have surely intensified. With the economically mighty states having numerous heritages nominated for inscription, Ethiopia’s active pursuit of this recognition indicates that there are no areas left unattended in its quest for prosperity. We also should congratulate the group that led the effort of inscription for its successful bid to have Ethiopia recognized for its cultural heritages. With numerous cultural heritages that need to be inscribed still left in the country, there is a more daunting task right in front of them as well.